Everybody responds to coaching and motivation a little bit differently. Did you know you can adjust your audio alerts to match your training style? Not only can you choose the voice of your coach (Alison for a female voice and Jim for male), but you can also decide when and how often you hear alerts. By default, you’ll get two notifications in addition to the standard “run” and “walk” commands. There’s an announcement when you reach the halfway point of the workout and another indicating that the last run is coming up. The halfway alert is an especially handy feature during “out and back” runs when you need to know when to turn around and start heading home. 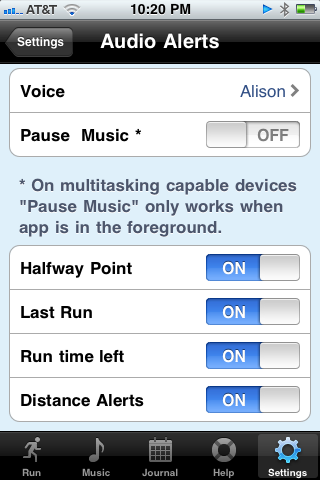 Notifications can be toggled on and off through Settings under Audio Alerts. There you can also toggle a third option, “Run time left,” which will let you know when you have 10, 5, 2, and 1 minutes left in a running interval (or continuous run). Some people like to lock their screen and power through a workout without thinking a lot about how much is down and how much is left. On the other hand, if you thrive on keeping an eye on the clock and knowing exactly where you stand, hearing how much run time is left might help you focus on running without glancing down at your screen. A solid in-between compromise is to activate only the halfway alert, so that you can zone out until your trainer tells you it’s time to turn around. Whatever your running style, it’s definitely worth taking the time to tweak your audio alerts to make sure they’re working for you. If you’re unsure of the best way to go, experimentation is the only way to find out what you like best. Consider changing things up for your next workout. Even if you’ve been pretty happy with your alerts so far, adjusting these settings can help keep you on your toes. Mixing it up a little is good for your mental conditioning and — who knows — you might fall in love with a setting you’d never considered. New Features for GPS Users! Following our recent update, the halfway alert can now be set up based on distance. In addition, new custom run distances allow you to choose a distance and count it down to the end. Distance alerts will count down your miles from six remaining, plus final reminders at a half mile and 500 feet left. Kilometers will count down at 9, 8, 6, 4, 3 and 1.5km, with a final reminder at 200m remaining. If you haven’t opted for the GPS upgrade, there’s more reason than ever to give it a try. As always, please let us know what you think! This entry was posted in BootCamp, Ease into 5K, iPhone, iPhone App, Running. Bookmark the permalink.